DESCRIPTION: Formed by glaciers and encircled by mountain peaks and deep green forests, Lake Pend Oreille is one of the largest inland lakes in North America. The name originates from the early French trappers who referred to the pendent ornaments which were worn in the earlobes of the local Indian tribe. A renowned recreation and fishing mecca with a shoreline of 111 miles, its depth has been measured in excess of 1,225 feet. 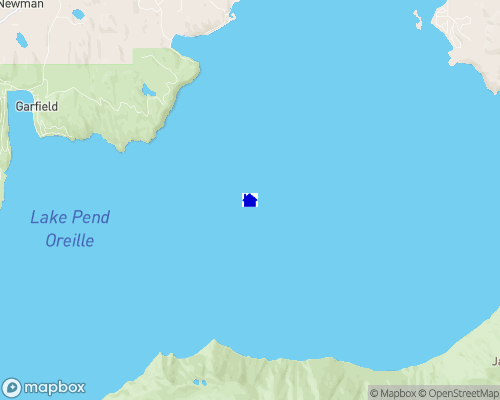 Lake Pend Oreille, Idaho's largest lake, beckons summer visitors, with over 100 miles of shoreline, most of it undeveloped. Its deep blue waters and myriad of waterfowl and wildlife attract young and old alike. In addition to its stunning beauty, fishing, water skiing, sailing, windsurfing are all popular sports on this lake. Depth of Lake: 1150 ft. Nearby cities: Sandpoint-30 min., coeur d'Alene-45 min. Lake Pend Oreille has a reputation for excellent fishing. Anglers can try for kokanee salmon, Kamloops, rainbow, brown, brook and hybrid trout. It also has populations of largemouth bass, whitefish, yellow perch, black crappie, bluegill and brown bullhead. Sandpoint offers fantastic eateries and shopping including the famous Coldwater Creek. Numerous cultural activities abound such as the The Festival at Sandpoint, where nationally acclaimed musicians perform before a backdrop of lake, mountains, and rising moon. Arts and Crafts Fairs, Winter Carnival, Lost in the 50's, the International Draft Horse Show, are just a few of the great events that occur throughout the year. Hidden Lakes is one of Idaho's top 10 golf courses. Moose and elk abound in the area. Schweitzer Ski Resort attracts recreational winter enthusiasts from all over the United States.